Teeth whitening is one of the fastest and easiest ways to brighten your smile. The beauty of a dazzlingly white smile is admired around the world! In youth, most of us are blessed with bright white teeth. However, the effects of age, dark-colored foods and beverages, lifestyle choices such as tobacco use, and other factors can turn your pearly whites dark and brown or yellow. Store shelves are lined with products claiming to brighten stained teeth, but they are much weaker than professional whitening, and the results are often disappointing. Whitening should always be done under the supervision of a professional so we may rule out any underlying causes for the discolouration of your teeth and we can help you choose the whitening option that will best achieve your desired results. The whitening options available at New Age include in-office treatments and take-home kits. 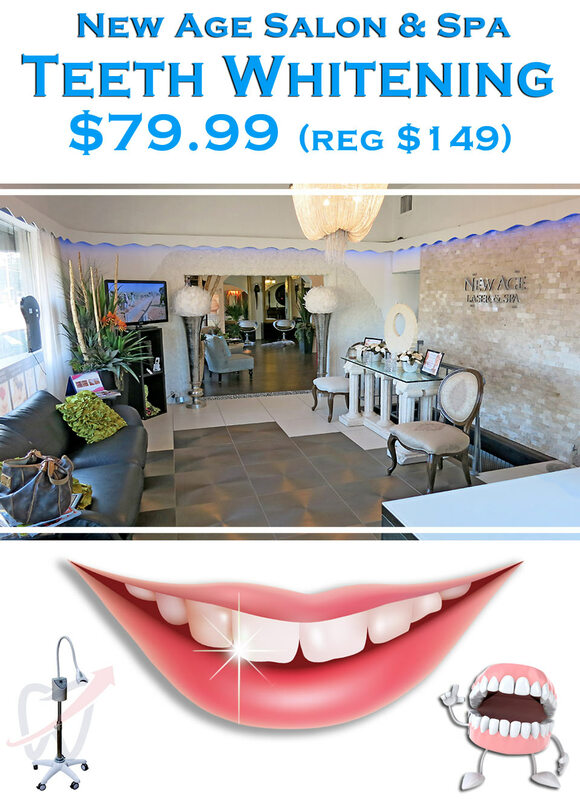 We provide safe, effective, professional teeth whitening solutions for residents of Cambridge, Kitchener and surrounding areas. We are proud to offer ZOOM!, the number one patient-requested teeth whitening brand. It is performed here in our comfortable office, and a single session can improve the color of your teeth as much as eight shades. Results are seen immediately, and the entire process only takes about one hour. This is especially popular with patients who want to brighten their smiles in time for an important event, such as a wedding, big date, or class reunion. The ZOOM! whitening procedure is convenient and comfortable. We will begin by applying a protective barrier to soft tissues in your mouth, so the gel only contacts tooth enamel. Next, your teeth are coated with the light-activated whitening gel. The LED light is applied for 15 minutes, and then the whitening gel is removed and reapplied. Full treatment includes three consecutive sessions, totaling about 45 minutes. During this time you can watch your favorite movie, listen to music, and relax in a comfortable chair. Take-home trays are also available. Results may vary depending on the individual and patient’s health history. While some of our patients had great results, results are not the same for everyone.